Home » Do Not Buy Gold! Even though today is only 12/31/10, I am calling this my first call out of 2011 – DO NOT BUY GOLD!!! I have been doing my usual reading and I must have read six or seven different posts about why gold is great, and why now is the time to buy gold (actually, there was one about silver, but it is the same thing – DO NOT BUY SILVER!). Look, without a doubt, gold can and most likely will continue to go up in the short term – as long as there are huge fears of inflation in the future. But gold will go back down, it always does, and it may not go as low as it once was (since it is a finite resource), but it will go back down. Everyone is talking about it – the sure sign of an asset bubble is when everyone is talking about it. Like I said above, I have read about gold everywhere. Also, it is all over the news, you see it on CNBC, its everywhere. This points to a huge bubble! Look at the charts of the last bubble! We are nearing this level of speculation. And then look what happened a year later. You decide. Institutions are NOT buying gold. If you look at the institutional ownership of GLD (see below), institutions do not even own half of the assets. This shows that it is being driven up by individuals who are looking to profit from the ride. Most funds and stocks push over 70% institutional ownership. If the big banks aren’t buying it, should you? Usually they know what is going on well before the general public. Finally, gold pays no dividend. You spend your hard earned capital on this stuff, and it pays you nothing to hold onto it. And that is if you buy it in a fund. 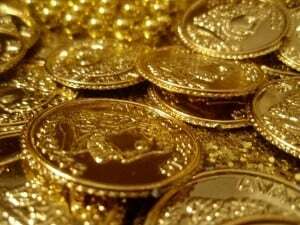 If you buy real gold, there are all kinds of costs – you have to pay a premium per ounce, you have to store the stuff (safe, safe deposit box, broker, etc), then you have to find a buyer. Why not invest in a solid dividend paying stock? Now, I’m not saying its time to sell gold. It still could go higher. But I don’t think investors should be buying any more gold, and if they do have a position in it, they should monitor the position closely for any pullback in price. Readers, what are your thoughts on buying gold? I am surprised you did not attract the wrath of the gold bugs yet. There’s a lot of believers out there who are expecting at least 1500$ gold in 2011. No gold for me in 2011 as I plan to stick with an oil oriented portfolio. Hahaha…no gold bugs yet. I think the gold bugs will meet there demise in 2011. I’m with you in sticking with energy. Gold isn’t either, but the uses for each are not really driving the price. Commodity investors and speculators are. As a “gold bug”, I’ll tell you why most of us aren’t commenting. The article barely merits a response; it’s style and reasoning are equally sophomoric, as are the commenters. Bookmark this bit of internet noise, check it in a year along with the price of gold, then ponder the excruciating reality that everybody thinks he’s a genius in college. Ernie, I wish you would elaborate more on why you’re a “gold bug”. I simply cannot find a good reason to buy into it right now. If you read the post, I mention that if you own it, it may not be the best sell point, but it definitely isn’t a buying opportunity. Perhaps no “gold bugs” bother commenting on this, as every single one of your tired, trodden bulletpoints has been addresses hundreds of times already, but yet, you found it necessary to write a new article with your “unique insight”. But hey, keep your portfolio in precious paper currency (or denominated assets), as the US debt closes in on 100% of GDP (or 6.5x tax intake, not counting GSE debt), the deficit reaches $1.56tn, state deficits $191bn on top of this, and municipalities are starting to collapse. And that’s not even considering unfunded liabilities and unfunded public pension funds, which have the implicit backing of the US Treasury. But how does this equate to gold rising higher and outperforming other asset classes? This seems like the contrarian view that the entire U.S. economy is going to collapse. I agree Gold may go higher but It is not an investment I would make at this time. I come out with a portfolio to beat the market each year and gold funds are missing from the 2011 portfolio. 1- Gold price only depends on what people are willing to pay for it- you mean like currencies? Such is the nature of trying to hold most value. 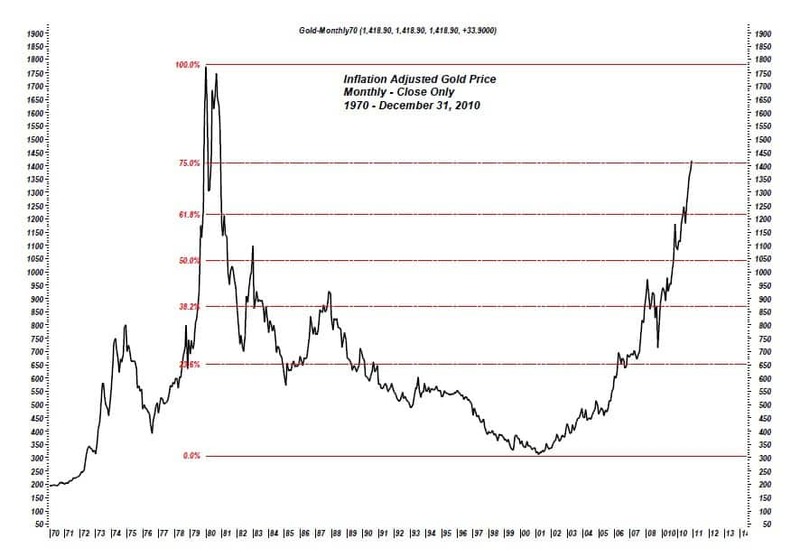 2- Not only is your gold price chart outdated, but it uses nominal values vs. real. Comparing the 80s to now, gold is underpriced. 3- GLD does not equal gold. GLD is paper gold. Great post! It takes a lot of guts in this day and age to go against the Gold Bugs. But, gold is not a good investment for the long term. Those who think differently are not looking at the investment objectively. I like how you briefly mentioned silver only to say “DONT BUY! !111”, then said absolutely nothing to back up this statement. Hell you didn’t even mention the 82% increase it had in 2010.. tremendously outperforming gold. Institutions aren’t buying gold or silver? I know an institution with about 1.5 Billion members…maybe you’ve heard of it… CHINA. Ring any bells? what about the Russian Central bank buying gold by the TON. Yeah, you’re probably right, no institutions are getting involved. I found the title most interesting. It doesn’t state reasons that you shouldn’t buy gold, or my opinion on gold. It is an exclamation that gold should not be purchased under any circumstances. I don’t consider myself a “gold bug” but tend to be a realist. Until I see some evidence that the US administration is trying to strengthen the US dollar, then gold and silver provide decent alternative currencies. Although I do think that silver has gotten ahead of itself. Gold didn’t go back down against the Weimar Deutsch Mark or the Zimbabwe dollar. In fact, I can only recall once that it went down: when the Paul Volcker allowed interest rates to float to their natural levels. But today Gold will not go down permanently against a US dollar which is being created ex nihilo electronically by the Federal Reserve Bank. At best, austerity measures, in the unlikely event that they were to be implemented in the US, would only staunch the bleeding, it can’t recover the blood already lost. Debts, both in the private sector and the public sector, are being monetized. Fiat currencies are debt. When the issuer is insolvent, the currency debases quickly. Once foreign creditors like the Chinese stop accepting US debt, the game is up (and this is already happening). Gold and silver will be the only money remaining on a pile of worthless paper. That’s why commodities are in a bull market–it’s not just precious metals, but anything with value–because US debt notes are losing their global currency. I’ve implemented an important gold exposure into my trading accounts and it is performing superbly. Moreover, it is an insurance policy against the insane acts of the Federal Reserve Bank and the US Federal Government. Thanks for the most informative comment yet! Wow, a lot of gold lovers out there. Would gold have a value if our society’s structure was so damaged? Hey, my trackback didn’t appear? I own gold not to flip, but more for the reasons that Peter outlines — it is more akin to cash than a stock or bond, but it’s an anti-paper form of cash. Interesting post but I disagree with you on a few points; I don’t think that the private individuals driving up the PM prices right now are in it for the ride. What makes you think so? The average joe will be in it for a hopeful ride when this thing really begins to bubble, but not until then, and we haven’t hit that bubble yet. No one is talking about this! Have you tried talking to the people around you about this? The day this becomes a bubble everyone will be yapping about it. Well, I’m not sure what kind of environment you live in but for me… 99% of the people around me don’t even know you CAN invest in this physical. I’m not saying there won’t be a bubble I just don’t think we’ve hit it yet. From what I see now most private individuals buying PM are buying to HOLD, not to profit. I enjoyed reading Peter Dunn’s comment, the vibe I’m getting from others that hold a position is that they buy to retain their wealth against a falling dollar, I think they have a point. How many pieces of paper did the Feds print recently? I completely understand how gold can protect “purchasing power”, but this doesn’t apply to 99% of individuals. To make this argument hold, an investor would need to hold all of their dollar-denominated savings in gold. When it came time to go to the store, they would need to sell the gold the need to get cash, and use that cash to pay. Nobody does this. 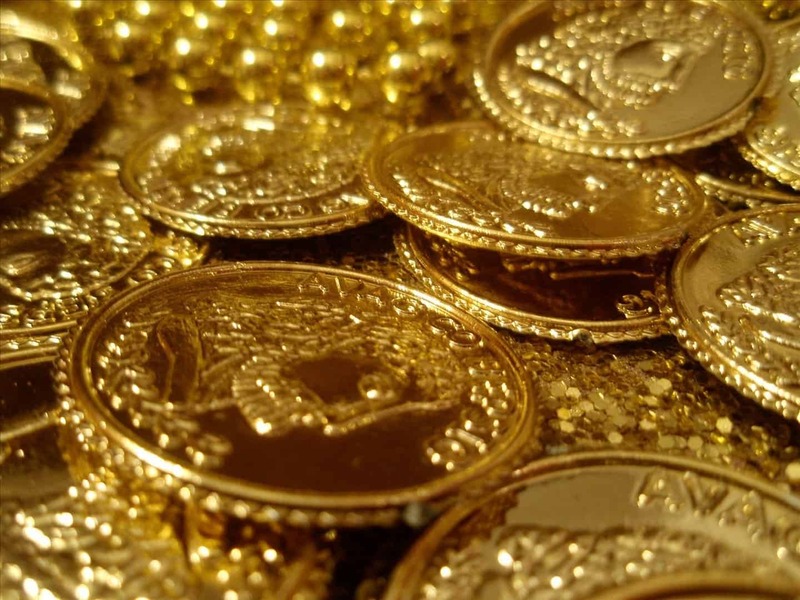 They hold gold in a safe deposit box or other account, and it is an “investment” portion of their assets. For the same amount of money, they could invest in an index fund, which would return more for them over the same inflationary period. The Fed has printed a ton of money, and inflation will inevitably come back, and the dollar will weaken. However, unless you are doing overseas business, most Americans will not feel too much of this. And for investments, stocks have historically outperformed gold during these times (although gold has performed well during these times, just not as well as stocks). I agree, dont buy gold. The price has been increasing over the past 2 years and it seems a little late to jump into the bubble and expect tremendous returns. Instead buy silver or corn. Both of these commodities will have outstanding gains this year. What people don’t seem to understand is the fact that we are probably going to have to go to a gold standard which will increase the price of gold 10 times and your 401k investment and pension will be no longer. You can hedge your wealth with gold not an IRA. I can not believe more people are not aware that Europe is in such distress and after months can’t come to a reasonable fix for there financial system. The good news is you will get to see what happens over there first becomes the wave will end up over here.